The end of the extractor hood. The beginning of freedom, beauty and functionality with BORA. From master carpenter to kitchen revolutionary, creator of Bora, Willi Bruckbauer knows what is important when it comes to the modern kitchen: it’s about creating a living space that meets people’s needs. Extractor hoods don’t do this – they are loud, not very effective, block your view and can limit your design possibilities when planning your kitchen. As a result of continuous experimentation and discovery, Bora created an effective vapour extraction system that meets the highest standards of both technology and aesthetics. Winning awards and prizes, Bora has worked their way into recognition for their innovation and architecture in the Kitchen. The elegant Bora extractor leaves no room for cooking vapours and smells to rise, drawing them directly from the cooktop into the extractor. The understanding of physics and the basic principle of fluid dynamics creates a cross flow that is larger than the rising speed of the cooking vapour. 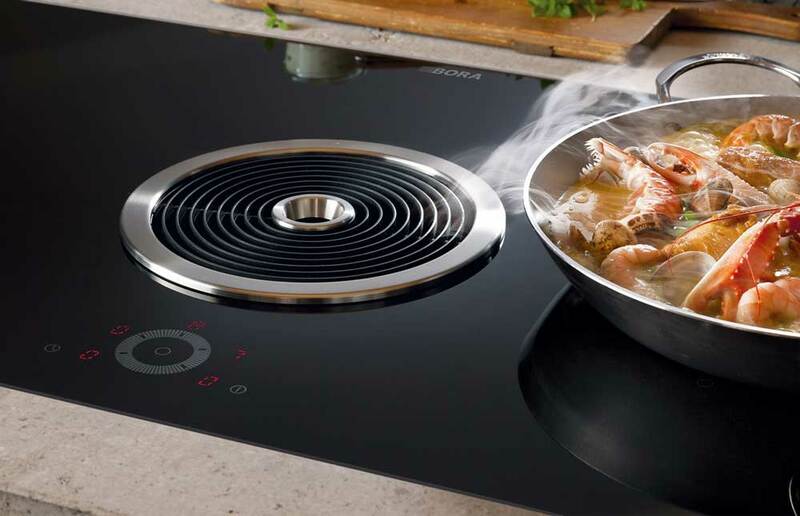 With vapours rising at a maximum of one meter per second, the Bora cooktop extractor draws off the vapours in a downward direction at four meters per second. The higher lateral flow removes cooking vapours and smells effectively, eliminating a lingering food smell and keeping the air fresh throughout cooking meals. The perfect features for functionality. Displaying and giving live demonstrations of the Bora basic in our showroom, we give you the opportunity to see your new cooktop extractor in action, we don’t just talk about it, come along to our showroom and we’ll show you the Bora basic cooktop in action. If in doubt, bring along your own ingredients and give it a try for yourself. The Bora basic combines high performance and a unique design into a compact solution. At an attractive, price-performance ratio, the basic is the perfect solution for kitchens in any home. This original design has been awarded the “red dot” product design award in 2012, redefining ergonomics and efficiency in cooking. 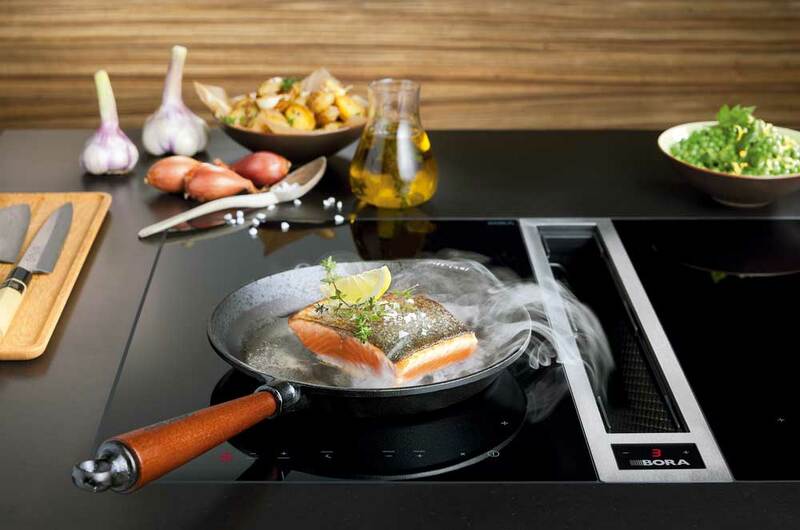 Bora classic offers many different cooktop models like the stainless-steel grill, gas glass ceramic cooktop, induction glass ceramic wok and more. Your creativity with cooking is extended with the Bora classic, allowing freedom and efficiency in everyday cooking. When cooking vapours are drawn downwards, they leave the air fresh, reducing the chances of odour and grease particles being distributed in the room and settling on furniture, leaving the air and your home fresh for longer. Unlike cleaning an extractor hood, Bora cleaning isn’t time consuming or tedious. The parts can easily be dismantled and placed in the dishwasher for a quick, simple after-use clean-up. Significantly quieter than a conventional extractor hood, Bora sounds no higher than a steak being grilled even at the highest level. Perfect sound reduction further reduces noise to make your cooking experience more enjoyable. Head-height extractor hoods are eliminated to create a clear view of your dream kitchen, particularly advantageous in open plan kitchens. Say goodbye to annoying edges or corners poking through cupboards for you to bang your head on.